Irony will often occur as a form of speech in which what the speaker utters is the direct contrary of what he intends shall be understood. Irony (also known as “illusio,” “dissimulatio,” “ironia,” “simulatio,” “the dry mock”; etymologically from the Greek root “eirōneía,” literally means “dissimulation” or “feigned ignorance”), is a rhetorical technique by which the surface meaning of what is said is different from the underlying meaning of what is intended. 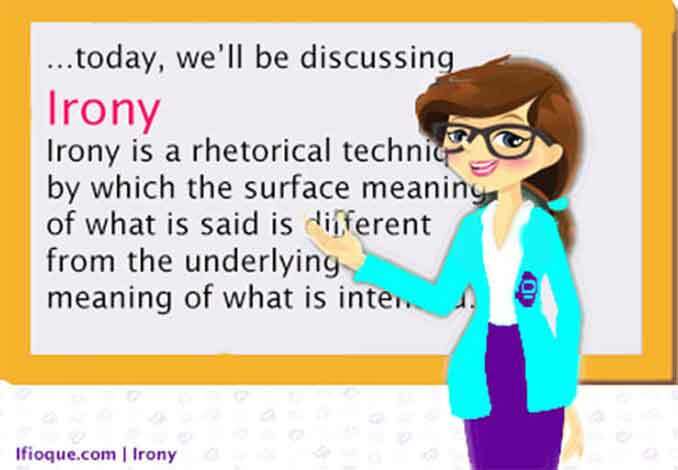 As with some other figures of speech, Irony brings about some added meanings to a situation. Ironical statements and situations in literature develop readers’ interest. Irony makes a work of literature more intriguing and forces the readers to use their imagination and comprehend the underlying meanings of the texts. Moreover, real life is full of ironical expressions and situations. On this note, Irony may be divided into three (3) sub-categories, namely: verbal irony, dramatic irony, and situational irony. I.	Verbal Irony — A type of irony which consists when a speaker uses masked words to express something in contrary to the intended meaning. This can be a form of decoy, in attempt to mask the speaker’s opinion especially where such opinion is deemed negative. For instance, one might say “oh what a happy day” when actually it’s been raining all day. He merely says that to masks his true feelings about the rain. Quite different from dramatic and situational irony, typically in verbal irony the speaker always has clear and definite intentions. The Lion King.Opens in new window — It was all revealed, that Scar killed Mufasa, ironically Simba doesn’t know this fact, and it created tension because Simba was in danger and worse still trusting Scar and doesn’t know Scar was behind all his misfortunes. FrozenOpens in new window. — This is a movie with a fantastic example of dramatic irony. Ela has powers she could not control (and we “the audience” knew this fact), but Anna doesn’t know this and thinks her sister is unfriendly, where in actual sense, Ela is distant simply because she’s terrified of hurting her sister. Little Mermaid.Opens in new window — In this exciting movie, it was all revealed, Ariel doesn’t know Ursula is only using her to get to Triton. Eric doesn’t know Ariel is a mermaid under a spell. Eric doesn’t know Vanessa is disguised to feign someone else to entice him away from Ariel. Likewise, Ariel and Scuttle don’t know the names for the stuffs we know, the likes of dinglehopper! Snarfblatt! which altogether enhances the comedic effect of the movie. When Cigar manufacturers warns “smokers are liable to die young” yet still producing more cigarette. When a classmate is complaining of Facebook being boring yet still posts updates on Facebook every other time. The meal taste awful complained a lady, yet she finishes her portion with no traces of crumbs. Oh too bad it’s Friday already, when in actual sense you are elated the weekend is here again. The way of distinguishing an Irony from the real sentiments of the speaker or writer, are by the accentOpens in new window, the air, the extravagance of the praise, the character of the person, the idea of the thing, or the vein of the discourse: for if in handy of these respects there is any disagreement from the common sense of the words, it appears that one thing is spoken, and another is meant.